The value of public art has been reflected throughout history. The early value Sarasota placed on public art can still be seen at St. Armand’s Circle. 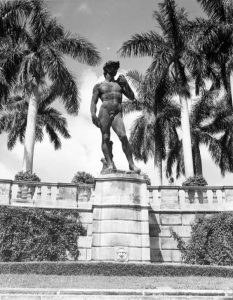 In the 1920’s John Ringling added 16 statues from his personal collection as part of his vision for what was then called the Ringling Isles. Many of those statues remain to this day and many more have been added to the collection. 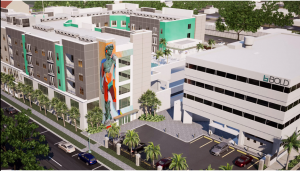 This dedication to public art has continued in the community and eventually became part of the Community Redevelopment Plan that the City of Sarasota adopted in 1986. This plan outlines the public art requirements for any property owner or developer who applies to the City for a building permit that exceeds $250,000. Thanks to this plan, we now have the pleasure of enjoying 79 (and counting) pieces of public art in the city. And those are just the city pieces, we have many more throughout the area! The idea of an American government requiring public art dates back to the New Deal in the 1930’s with the creation of departments such as the Section of Painting and Sculpture (later renamed the Section of Fine Arts), the Public Works of Art Project, and the Federal Art Project. But why would governments enact public art requirements? Although many people initially think only about the aesthetic value of public art, there is much more than meets the eye. Pubic art has the ability to create a community identity. Works like Cloud Gate (the Bean) in Chicago and the Gateway Arch in St. Louis have become symbols of their cities. In Sarasota, the replica of the statue of David at the Ringling Museum is incorporated in the logo for the City. Thanks to John Ringling and his early support of arts in Sarasota, David has been part of our community for almost 100 years. However, as new pieces of public art are added and our community evolves, we may see other pieces become part of our identify. Public art may become a visual representation of a community, but it also has the power to bring members of the community together through its creation. The Mable Ringling Memorial Fountain on Mound Ave is a beautiful example of public art bringing the Sarasota community together. 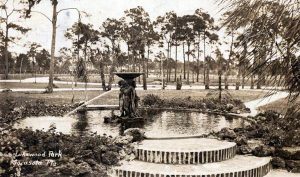 The fountain was originally erected in 1936, but throughout time the pieces were scattered and the fountain was filled with dirt. Left as an empty piece of land, a group of dedicated citizens set to work to collect and restore the pieces and bring the fountain back to working order. This was no small feat and the project activated diverse groups of the community to come together for a common cause. Public art is good for business. Commercial buildings that add a mural or sculpture benefit from the press related to the art and often end up serving as the back drop for films and photos. Thanks to the new murals that are going to be added to the BOLD Lofts, many of us have seen the building before it’s even completed! It is interesting to note that one of the new murals is a depiction of the statue of David, a re-imagined version of a traditional symbol of our community. Public art also drives tourism. 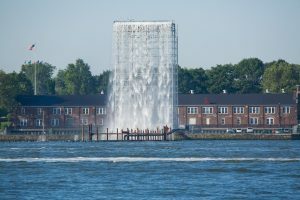 According to the Public Art Fund, New York’s investment of $15.5 million in their Waterfalls public art project brought in $69 million for the city. In addition to the community and economic aspects of public art, studies have found that public art provides health benefits as well. A recent study by Colin Ellard at the University of Waterloo found that people actually slow down when they walk past a piece of public art. Ellard states that, “good installations can reach inside our minds and exert profound effects on our behavior.” As people slow down, reflect, and discuss, stress levels are decreased and sociability is increased. We will never be able to truly quantify the value of public art, but we can appreciate living in a place where this long standing community value is being included in the future. A special thank you to the members of the Public Art Committee for dedicating their time and talent to ensuring that art is present in all of our lives! Throughout the summer, the Arts and Cultural Alliance will spotlight some public art pieces. You may discover (or rediscover) some incredible works of art!